for the recipe and execution of this Yule Log! 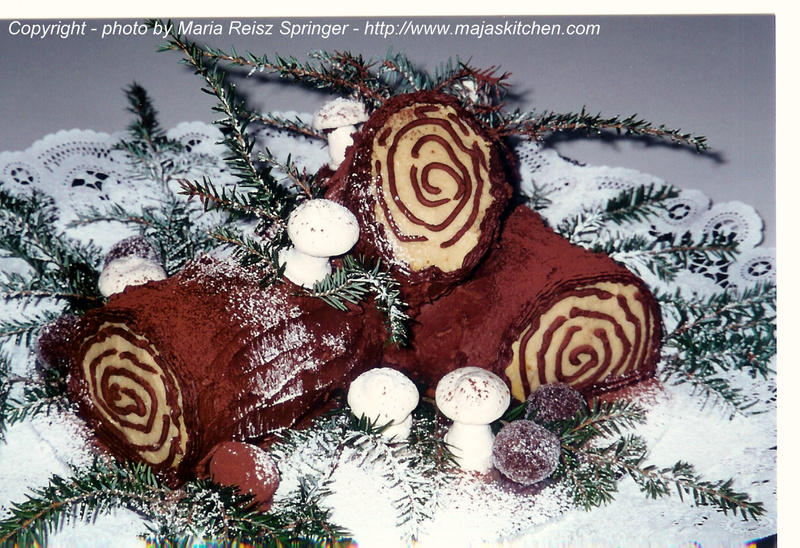 This beautiful pastry is called Yule Log, Buche de Noel, Christmas Log, Baumstamm or by any other name…it is still a wonderful Christmas Cake and will grace any table with beauty. This is where I have the most fun…working with the chocolate icing like working with clay. I am touched by your interest and loyalty..a big thank you to all………. a most wonderful Christmas, with family and friends. I wish everyone many Blessings in 2012! Look for more posts in 2012….and find me on Face Book! You are one of the very special people! Thank you so much for all of your wonderful contributions to all of us in so many ways. Merry Christmas and God’s blessing to you and your family. Thank you – Judy, for your very nice comment…..It has been so nice to see you and Key ….and meeting little Minori at the gingerbread decorating….I love having all of you here…. Hope you all have a wonderful Christmas …. and all the Blessings in 2012! My husband’s mother used to make the most wonderful desserts. Thank you for sharing all of your wonderful treasures. Merry Christmas! Best wishes to you in 2012. Hi Julia…..it is so nice to hear from you!!!!!!!!!!! I know that the Ewinger Neni made wonderful cakes…so did all the women in Veliskovci…I remember one summer they all came to my grandfather Reisz’s Inn to prepare for a wedding…there were many long tables lined up in the garden where the women from the village came and placed their layered cakes with lots of different icings on them…It was like a competition among them who would bring the most interesting and best tasting, and most beautiful cake that day…. Please, tell Hi to all the Ewingers….and I wish you and all your family a very Happy Christmas and lots of blessing in 2012! That is so cool!!! I’ve looked at those recipes and I’m just not very good at the decorating part. Maybe one of these days I’ll have to give it a try anyway….Hope you have a very Merry Christmas and we’ll hopefully see you in the New Year. I wish you and your family a very Blessed Christmas, and lots of success and blessings in 2012! Maria, The Christmas log looks delicious. I love chocolate (and cake, too). It is truly a work of art. Happy Christmas to you, Dale, Charlie and family.